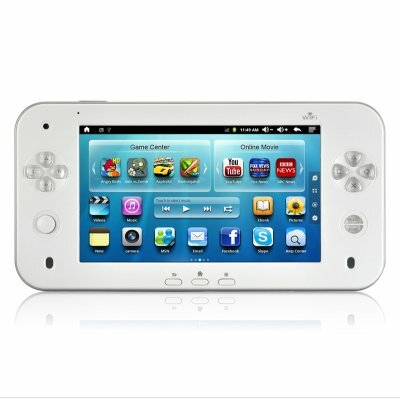 Successfully Added Android Gaming Tablet "Pearl" - Console Emulator for Classic Games to your Shopping Cart. New Android 7 inch tablet complete with old and new school emulators and hardware joysticks and buttons built right in right out of the box to satisfy both your gaming and media fixes in one incredible package. Ever yearn for old school games like Super Mario, Castlevania: Symphony of the Night, Sonic the Hedgehog, Street Fighter, Tetris, Zelda and all the other greats? With the "Peals" custom built OS based on everybodies favorite open sources Android system as well as the built n hardware analog jpysticks and gaming buttons (no software input for this baby) this is not only possible but super easy to make a reality. Built in with MAME Arcade, NES, Nintendo 64, PS1, SNES, Gameboy, GBA and Sega Genesis/Megadrive emulator games all you need to do is either use the built in cloud "Game Center" app to directly install games or alternatively download your choice of games if not available on the cloud directly to your 8GB of internal memory for a great PLUG and PLAY experience. With 7 inch screen and high resolution screen and A9 high speed CPU, this excels for all your gaming needs. Made not only for gamers with, you will also get a the great tablet media functions you crave. Take photos, watch youtube videos, download and watch your movies and music, or use wifi and skype to chat with friends and family with its inbuilt face-time camera! With up to 5 hours of web surfing, whilst getting a load of your favorite blockbuster movies or top tunes, you can rest-assured without battery issues with its 3800mAh battery! Available in our warehouse now, this 7 Inch Android 2.3 A9 CPU Tablet is ready for immediate shipment to you or your customer. Guaranteed to be the next hot item in your online store, order now before everyone gets their hands on it and make a nice profit for yourself! Brought to you by Chinavasion, the leader in wholesale consumer electronics. The looks of the Pearl is amazing.... I bought the gaming tablet for my kids and I have I question, Do you have a cover for it???? ?